Published to coincide with the 50th anniversary of C. S. Lewis’s death, this complete guide covers all of Lewis’ works, from his literary criticism to Narnia C. S. Lewis’s work is widely known and regarded, but enthusiasts are often only aware of one part of his work—his children’s stories and his popular theology; and yet he wrote so much more, including science fiction and literary criticism. 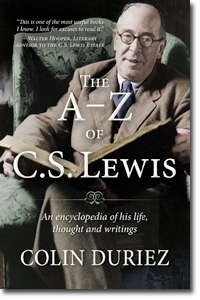 This volume brings together all aspects of C S Lewis’s life and thought. Arranged in alphabetical order, it begins with The Abolition of Man—written in 1943 and described as “almost my favorite”—to Wormwood, a character in The Screwtape Letters. This book will delight anyone who is interested in C. S. Lewis and wants to learn more about him, his thought, his works, and his life. Colin Duriez is a writer, editor and frequent lecturer on the lives of C.S. Lewis, J.R.R. Tolkien and the Inklings, having spoken at a variety of conferences in the USA, Canada, Spain, Italy, Poland, Finland and the UK. His books include The A–Z of C.S. Lewis, C.S. Lewis: A Biography of Friendship, J.R.R. Tolkien: The Making of a Legend, J. R. R. Tolkien and C. S. Lewis: The Story of Their Friendship, Tolkien and The Lord of the Rings, A Field Guide to Narnia, The C.S. Lewis Chronicles, The Inklings Handbook (with the late David Porter), A Field Guide to Harry Potter and AD33: The Year that Changed the World. He has also contributed to The Tolkien Encyclopedia and a number of other tomes. Duriez has appeared as a commentator on extended version DVDs of The Lord of the Rings trilogy, Walden Media’s feature, Dreamer of Narnia with The Lion, the Witch and the Wardrobe, BBC television’s The Worlds of Fantasy, PBS’s The Question of God, a documentary about Focus on the Family Radio Theater’s audio dramatization of The Screwtape Letters, among others. The author makes his home in the Lake District of northwest England. To me this is obviously a reference book and not something you would just read cover to cover. That fact is preciously one of the things I love about it! The A-Z of C.S. Lewis is like a dictionary, encyclopedia and thesaurus of everything C.S. Lewis! I had no idea he had written so many other things outside of the Chronicles of Narnia and was so intrigued to see what some of his other works encompassed. Many of the excerpts in this edition have led me to be intrigued by other works of his. The main reason this book is being used in our house so much right now is because my 11 year old son is reading his way through the Chronicles of Narnia and finds it helpful to have explanations of the characters, locations, etc. The A-Z of C.S. Lewis is a one stop shop for everything C.S. Lewis related and a great addition to any homeschool library collection. Disclaimer: I want to thank Colin Duriez and Litfuse Publicity for supplying me with a hardcover copy of this book for me to review. While I received this free of charge in exchange for my review, my opinions are my own, and have not been influenced in any way.